I blogged about some parenting articles back in October and again in February, in response to the wonderful parent education event we held with Sheri Glucoft-Wong (which you can still watch on our Youtube page) and feedback from families eager to continue the conversation about how we come together as a community to raise children. With that in mind, here are a few more thought-provocative articles related to parenting that have come through my inbox in the last several months. What impact does social media have on middle school girls? “60 percent of elementary-age girls said they were happy the way they were; 67 percent of boys said the same thing. By middle school, those numbers had dropped for both genders, but significantly for girls overall: to 37 percent, with 56 percent for boys.” Whatever your child’s gender, Lory Hough’s article Girlhood in the Harvard Ed Magazine is compelling reading. How can boys experience greater emotional diversity? “Recent work by psychologists reveals the once-hidden benefits of experiencing a diversity of emotions, both positive and negative…And yet the research suggests we are not fostering emotional diversity from a young age, especially when it comes to raising young boys.” Jane Gruber and Jessica Borelli’s short piece in Scientific American speaks strongly to the developmental need to allow boys to experience, identify, and understand a wide range of emotions. What’s the best way to ensure my child’s happiness? Our results demonstrate that not all pursuits of happiness are equally successful and corroborate the great importance of social relationships for human well-being.” Jenny Anderson’s piece in Quartz weaves science and personal narrative to make a compelling argument that “The thing that makes us happiest in life is other people”, and that our greatest and most important work as parents is to teach our children how to be good friends and compassionate peers. Should my child be doing more homework? Joe Pinsker’s article in The Atlantic summarizes the research (the short answer is no), explores the benefits and drawbacks of homework (it can create a home-school connection if one doesn’t exist, and there’s a correlation between in-class test performance and homework in secondary education), and defines good homework as meaningful, relevant, timely, and furthering student learning. Do you wonder Why Girls Beat Boys at School and Lose to Them at the Office? I welcome your thoughts on these articles, or any other resources you’ve found helpful in your own journey as a parent. Our whole community benefits from this dialogue. And I hope to see many of you on Friday for the parent education event Ending the Silence: Supporting Mental Health immediately following the First Friday assembly. What impact does social media have on middle school girls?“60 percent of elementary-age girls said they were happy the way they were; 67 percent of boys said the same thing. By middle school, those numbers had dropped for both genders, but significantly for girls overall: to 37 percent, with 56 percent for boys.” Whatever your child’s gender, Lory Hough’s article Girlhood in the Harvard Ed Magazine is compelling reading. What’s the best way to ensure my child’s happiness? “Our results demonstrate that not all pursuits of happiness are equally successful and corroborate the great importance of social relationships for human well-being.” Jenny Anderson’s piece in Quartz weaves science and personal narrative to make a compelling argument that “The thing that makes us happiest in life is other people”, and that our greatest and most important work as parents is to teach our children how to be good friends and compassionate peers. A few more quick, interesting links:The first segment of this podcast makes The Case Against EducationHere are 10 Tips for Raising Global ChildrenDo you wonder Why Girls Beat Boys at School and Lose to Them at the Office?I welcome your thoughts on these articles, or any other resources you’ve found helpful in your own journey as a parent. Our whole community benefits from this dialogue. And I hope to see many of you on Friday for the parent education event Ending the Silence: Supporting Mental Health immediately following the First Friday assembly. In February, we posted a link on our Facebook page to an article in the Atlantic about how elite college admissions processes are broken. How extraordinary to have news of a national college admission bribery scandal break last week! If you aren’t already inundated with various takes on this distressing news, I recommend Alexandra Robbins excellent piece Kids are the Victims of the Elite-College Obsession (and you may want to check out her great 2006 book, The Overachievers). Likewise, if we want them to be reflective, we must consider other perspectives on our behaviors, and become aware of our own bias and assumptions. If we want them to be creative and playful, we should take the time to play with them. If we want them to be curious, we can ourselves be constantly asking new questions and seeking to learn new skills. If we want them to be collaborative, we must show them to work respectfully, respond to differing perspectives, compromise in order to achieve shared goals, and assume shared responsibility. If we want them to stand up for justice and equity, then we need to realize that using all of our resources to give them every advantage may not give them every advantage. How terrible for those children not to be given the chance to achieve to the best of their own abilities. Sometimes acting in the best interests of our children means not acting! As hard as it is to sit on our hands as adults, our children need to make mistakes and struggle — the path to developing deep resilience and persistence is filled with obstacles and failures. By being cold, wet, and hungry, they learn to truly appreciate being warm, dry, and fed. In our community, though attending an “elite” school is not often viewed as the only way to achieve adult success, we all face difficult choices in parenting and supporting our children. When your child has challenges in academic or social relationships, how will you react? There will be choices to be made about which activities to pursue; will you support your child’s passions, and listen to their voices if they start to lose interest or burn out? I encourage you to take this opportunity reflect on the ways in which your family might approach the path of your child’s education in future years. It is a great pleasure to be partners with you in this work. We are pleased to welcome a guest blog written by Jennifer Ellis, Vice President of the Gateway Board of Trustees. Last weekend, I had the privilege to attend the California Association of Independent Schools (CAIS) annual conference that is held for Board Trustees and Heads of School, representing Gateway in a crowd of over 600 attendees. Because we are accredited through CAIS and therefore members of the organization, we have access to the incredible resources and support, educational opportunities, and recruiting network it provides. Jim McManus is the long-time executive director of CAIS, and he delivered a speech to start the conference in which he shared excerpts from letters between the original presidents of Stanford University and the University of California. In their correspondence, these civic-minded educators spoke about their joint missions of educating for moral character, so that our children learn to be good citizens of a democracy, and contribute to society in meaningful ways. Jim went on to then share the current mission of UC, which now focuses on the “transmission of knowledge” and is absent of anything that speaks to the building of character as part of meaningful education. This is where independent schools come in, is the point Jim was making. Schools like ours have the liberty to hold onto other ideals; we exist to do more than simply transmit knowledge. 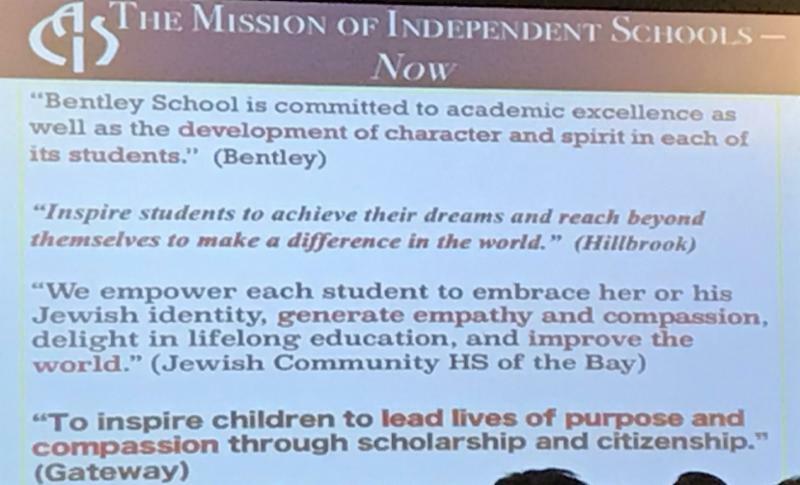 Jim then shared the current mission statements of a handful of schools across the state, and prominently displayed among them was Gateway’s mission statement, which our faculty, administration, and Board worked hard to articulate several years ago, and which continues to guide all of the decisions we make as a school: To inspire children to lead lives of purpose and compassion through scholarship and citizenship. The weekend filled me with a sense of pride and excitement about the work we are doing at Gateway, and a sense of solidarity with other independent schools in California. Indeed, it was exciting to have Gateway recognized as a model and a vanguard among these schools, and I am confident that our reputation will only grow, as the decisions that we make at Gateway continue to be guided by this meaningful mission. In October I put a list of parenting links on my blog, in response to the wonderful parent education event we held with Sheri Glucoft-Wong (which you can still watch on our Youtube page). To continue that community conversation, next Tuesday at 6:00 we will be hosting a screening of Won’t You Be My Neighbor, a recent documentary about the life and career of Fred Rogers. In the meantime, here are some provocative articles about parenting and child raising that have come through my inbox in the last three months. How do we raise children to be grounded, not spoiled? Joe Pinsker believes that The Way American Parents Think About Chores Is Bizarre, because “the chores-for-allowance agreement…can give kids the sense that they’re entitled to rewards for fulfilling basic responsibilities.” Instead, he proposes we recognize that children are eager to help, and find fulfillment by serving a useful role in the family. How do we strength our connection as a family? In Raising the Mindful Family, Elise Goldstein and Stefanie Goldstein explore how individual, couple and family practices of mindfulness can lead to connection that transcends the busy schedules, long commutes and digital lives that create distance in many families. What’s my role in my middle schooler’s social conflict? Psychologist Lisa Damour offers three keys to parents. First, don’t confuse conflict (which is common) with bullying (which is rare); second, teach skills for healthy conflict; and third, let them pick their battles. Read about the the thinking behind these three key parenting skills in How to Help Tweens and Teens Manage Social Conflict. We usually focus on intrinsic motivation, not external rewards. It doesn’t matter where you go for college nearly as much as people think. In 1983, Isaac Asimov was asked to make predictions about the world in 2019. I welcome your thoughts on these articles, or any other resources you’ve found helpful in your own journey as a parent. Our whole community benefits from this dialogue. And I hope to see many of you on Tuesday at the screening of Won’t You Be My Neighbor! This time of year tends to provoke more than the usual portion of gratitude, and I’d like to take this space to express how profoundly grateful I am for Gateway School. I am thrilled at the way our program can face the unknown future with eager anticipation. We have the flexibility and innovation to consider the world students will be living in as adults, and to design educational experiences to prepare our children for that future. I am impassioned by the rich education that we deliver to students. On one hand, we have a great emphasis on the lived experience of being a child, on valuing childhood and creating a joyful and secure school experience. On the other, we ensure our students are well-rounded individuals equipped with excellent academic, co-curricular, and social/emotional skills, as well as personal character, integrity, courage, and empathy. I cherish our faculty and staff. Rare it is to have a school where teachers are so committed to their own professional growth, to supporting each other’s success, and to knowing every child as a unique, complex, nuanced individual. From our custodians to our business office, everyone is here with one purpose in mind, and that is to create the best possible learning environment for the children. I am humbled by our families. From putting their trust in our faculty and staff, to prioritizing the family budget to pay tuition, to volunteering in the classroom and playground and with the Family Association and Board of Trustees, you do and give so much to make this shared dream a reality. We are very fortunate to be partners with you in raising your children. And of course, I am inspired by our children. Our student community radiates compassion and warmth. They are so full of curiosity and imagination, constantly revealing and revelling in new worlds and discoveries. Year after year, I see that our graduates possess a lifelong love of learning, and the confidence and skills necessary to thrive in high school, college and life beyond. Thank you for being part of this very special project, and happy holidays. On Monday morning, you could have heard these phrases spoken in our 7th grade Humanities classroom. The culmination of a literature study of S.E. Hinton’s beloved book The Outsiders, the students assumed costumes and characters to debate topics such as whether killing someone is ever justified, and the intersection of personal and social responsibility in conflict situations. Using the Anti-Bias Framework from Teaching Tolerance, this project succeeded in challenging our children’s preconceived ideas (and developed their public speaking skills): by the end, they were looking past what the “Greasers” wore and where they lived to think more deeply about the perspectives and experiences of those characters. Teaching students to truly listen closely to each other is just one of many ways that our Middle School pursues the part of Gateway’s mission statement focused on developing citizenship in our students. But it is not easy. At a young age — and even more so in early adolescence — children begin to listen defensively, to seize on perceived weaknesses, and to respond selectively. We believe it is very important to teach the skill of listening without judgement, and with an open mind that is willing to change its views based on new information. In our middle school, students apply critical thinking and problem solving skills in highly engaging and thought-provoking curriculum that often interdisciplinary. Through both academic curriculum and the Advisory program, our faculty create strong classroom communities where students see inclusion in action as a lived experience, and further conversations that move children and adults alike towards thoughtful anti-bias attitudes. Citizenship is an ongoing process that relies on self-reflection in pursuit of better self-knowledge, and it’s one of the many ways our Middle School supports our students on their journey to citizenship. I do hope to see you at tomorrow night’s Middle School Information Night, where you can experience the magic of our Middle School classrooms for yourselves. Of our school’s nine core values, play, creativity and innovation are perhaps the most natural and instinctive to human experience. We are born with an innate ability to play that continues throughout our lifespan — a trait shared only by a very few other species — and it has the ability to bring joy and balance to our daily lives. At Gateway, we embrace the idea that “play is a state of mind” advanced by the National Institute for Play. Children enter into lasting learning through their play, be it social, artistic, or intellectual. Through innovation and iteration, through making and tinkering with our hands and minds, we build connections within and between ideas and each other. The act of imagination is a unique neurological moment that activates emotion, memory and organization, and it can be applied with individuals, through collaboration, and to problem solving. Only when a child is rooted in play can her individual agency to make ideas into reality flower. You can see this value deeply intertwined everywhere you look in our program. Our daily schedule protects free time because that is one of the many types of play that is beneficial for children’s growth — recess is a wonderful “SEL classroom” where children learn how to be good friends and playmates. And from our specialist classes in studio art, music and the Discovery Center, to interdisciplinary projects and classroom activities, we ensure that children have access to many different types of playful engagement with content acquisition and skill building. Indeed, the Gateway education not only protects children’s love of learning, it teaches them to engage with ideas in an intellectually playful manner. Thinking deeply and critically might be serious, but it can also be serious fun! This questioning, creative spirit is a key part of our school’s mission to develop children to be scholars who can make positive change in the world. We know that as they move into high school, college, and life beyond, their ability to be playful and creative is a crucial element of their future success in work and relationships. How do we effectively prepare children for the world to come? Curriculum and education defined by historical facts and contemporary skills will always struggle to prepare children for their future. The challenges they will face are different from the ones we faced growing up; just look at how the pace of human knowledge creation has accelerated, and the impending automation of many traditional jobs. It’s a scary, humbling task we face! A recent article by Greg Satell posits that the skills children will need for their future are the ability to understand systems, to apply empathy and design skills, to communicate complex ideas, and to collaborate and work in teams. Already we see this driving elite universities as they look for intellectual curiosity among their undergraduate applicants, and in graduate programs that conduct group interviews to check for social cognition and communication skills. To this excellent list, Gateway adds another critical element: metacognition and self-reflection. Metacognition is the ability to think about one’s own thoughts and learn from them. It is also the key skill that helps students improve their learning process. Through metacognition, students become aware of their strengths and challenges as learners, and begin to monitor their use of learning strategies. They learn that their own learning processes can change, that they can iteratively use goal-setting and planning to achieve their objectives, and how to self-monitor and adapt. Through this process, students become confident scholars who develop inner standards of success and achievement, and learn to transfer their abilities to new tasks and contexts. We build students’ metacognition at Gateway by teaching them about the concept, by incorporating their authentic voices and choices into their learning, by explicitly articulating and modeling it in the work of faculty, and by regularly guiding children to engage in reflection. In grades fourth through eighth, families will see this driving force during the upcoming School/Family conferences, in which the students participate to present examples of their work, discuss their learning experiences, and review goals for their academic growth. Being metacognitive means being more aware of one’s journey on the path of learning. How much more pleasurable and intentional it feels for our children to be agents of their own scholarship, rather than perceive school as something outside of their control that happens to them!